A general strike can be one of the most potent noncooperation methods in the repertoire of nonviolent resistance. It is a widespread cessation of labor in an effort to bring all economic activity to a total standstill. Although it is easy to broadcast the call for a general strike, it is exceedingly difficult to implement for the maximal impact that it potentially exerts. What’s more, a general strike must be called prudently, because it loses its effectiveness if weakly executed. 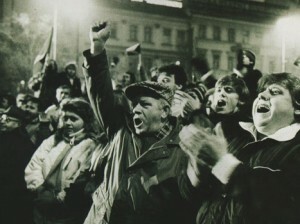 The Occupy movement’s calls for a general strike in the United States on May 1 make me think of an instance in which a general strike was brilliantly carried out and with great effect, in Czechoslovakia in 1989 — for only two hours. None of us knew what name to give to our movement. I then used the term “passive resistance” in describing it. I did not then quite understand the implications of “passive resistance” as I called it. … As the struggle advanced, the phrase “passive resistance” gave rise to confusion and it appeared shameful to permit this great struggle to be known only by an English name. The English word nonviolence is not much better. It is ambiguous and multifaceted. My students, for whom English is often a second, third or fourth language, frequently complain that the word “nonviolence” says what it is not but does not tell us what it is. 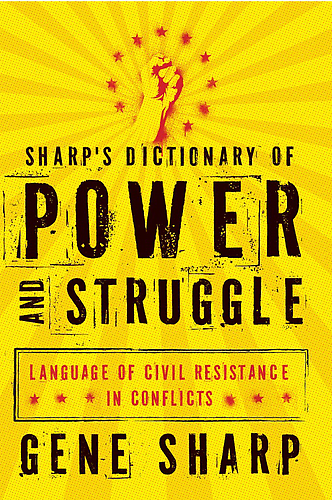 The ability of average people to study this subject with linguistic precision, however, has lately taken a quantum leap with Oxford University Press’s publication of Sharp’s Dictionary of Power and Struggle: Language of Civil Resistance in Conflicts, by the scholar of nonviolent struggle (and Waging Nonviolence contributor) Gene Sharp. 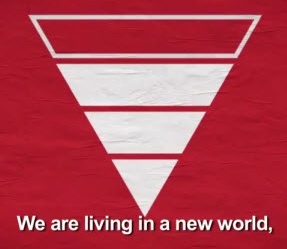 Still from "KONY 2012" representing an inverted pyramid of people-power acting on elites. Can a nonviolent movement be virtual, or does it require feet on the ground? The concept of “KONY 2012” appears to be about awareness targeted to North American supporters, not the people of Uganda or Congo where Kony calls home. If “KONY 2012” seeks only to raise awareness, but does not result in organized protest or the arrest of Kony, is it still an effective campaign? I thought it was a great question, coming at the beginning of an online course at the University for Peace (UPEACE) with 30 mid-career students from literally all over the world, and in regard to a phenomenon that is spreading just as far and wide. My response, however, is that the “KONY 2012” video and what it calls for, whatever its ultimate effectiveness, would not qualify as a true nonviolent resistance campaign, movement or mobilization. Discussion about changes to a Syrian street name, via The Highest Monkey. The opposition in Syria is not waiting for Bashar al-Assad to depart before drawing up new maps of their country. According to a recent Washington Post report, activists have been using a Google crowdsourcing program, Map Maker, to rename major streets, bridges and thoroughfares after their own heroes. The purpose has been to erase the remnants of the Assad family’s 40-year rule and to memorialize nonviolent challengers who have died during the course of Syria’s almost year-long uprising. 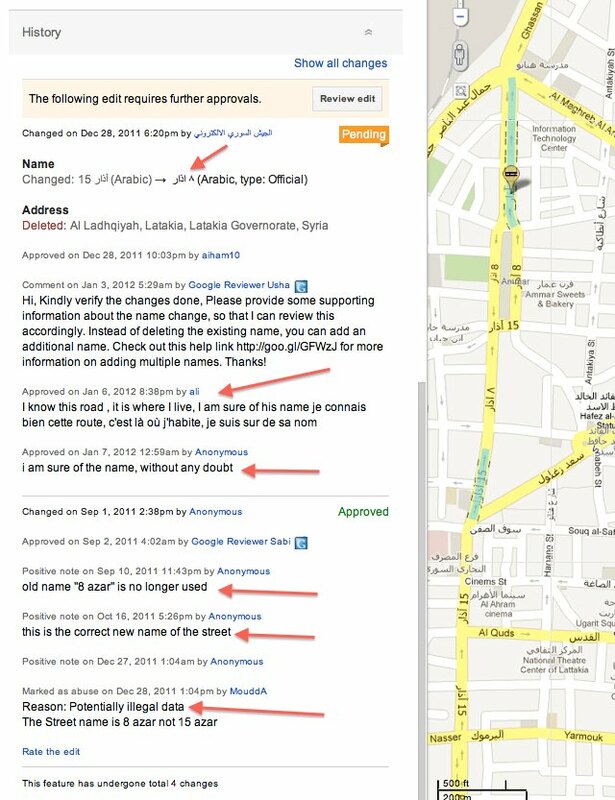 Stefan Geens, author of the Ogle Earth blog, which tracks Google Maps, told the Post that Syria’s is the first rebellion of which he knows where activists have used online mapping programs to rewrite history. 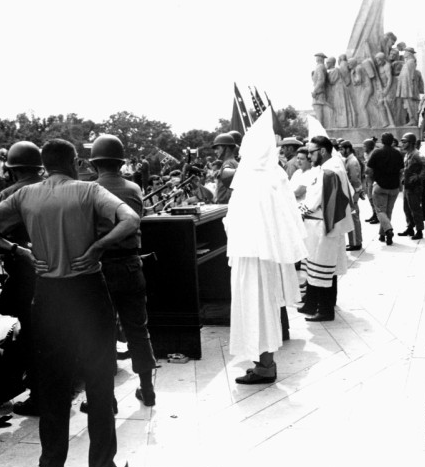 Ku Klux Klan rally on the Louisiana State Capitol steps in Baton Rouge in the 1960s. State Library of Louisiana Historic Photograph Collection. 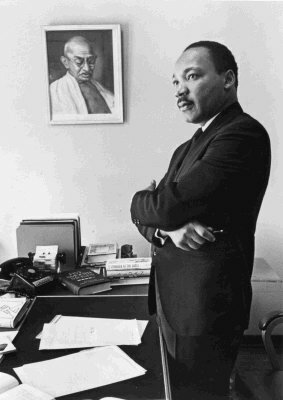 Martin Luther King, Jr. beside a picture of Gandhi. © Bob Fitch, all rights reserved. By the 1930s and 1940s, via ocean voyages and propeller airplanes, a constant flow of prominent black leaders were traveling to India. College presidents, professors, pastors and journalists journeyed to India to meet Gandhi and study how to forge mass struggle with nonviolent means. Returning to the United States, they wrote articles, preached, lectured and passed key documents from hand to hand for study by other black leaders. Historian Sudarshan Kapur has shown that the ideas of Gandhi were moving vigorously from India to the United States at that time, and the African American news media reported on the Indian independence struggle. Leaders in the black community talked about a “black Gandhi” for the United States. One woman called it “raising up a prophet,” which Kapur used as the title of his book. Illustration by Piotr Lesniak, Illustrations Portfolio. 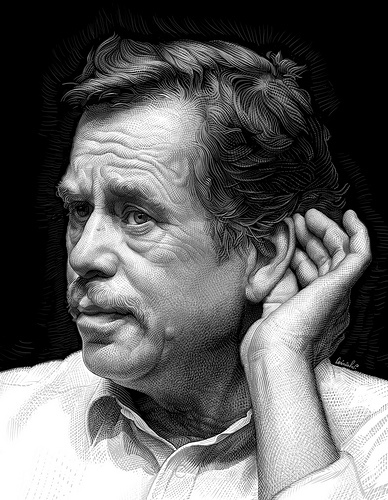 Václav Havel, who died on December 18, epitomized the power of the pen. A playwright and actor, he was born in Prague in 1936, two years before Nazi Germany militarily occupied Czechoslovakia. As I have written elsewhere, the Stalinist effort to destroy internal opposition to the Czechoslovak communist regime and its worsening economic policies led to hundreds of executions and tens of thousands of imprisonments. Millions were left suffering. Rigid communist economic views, bureaucratization of all dimensions of life, and recurring shortages meant that people could survive under communist rule only through venality and by shortcutting regulations. Those who went along with the habitual corruption—including the great proportion of managers and professionals—found themselves subjected to blackmail and entrapped by lies. 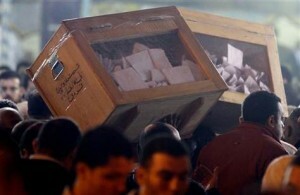 Egypt began its first round of balloting in November, one of the outcomes of the January uprising that ousted the dictatorship of Hosni Mubarak. 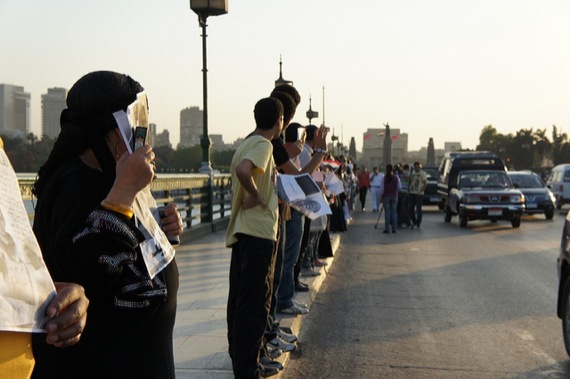 This followed the military’s attempt to hold onto power by using draconian measures against renewed protests in Tahrir Square, where military and police killed 40 and injured 2,000. 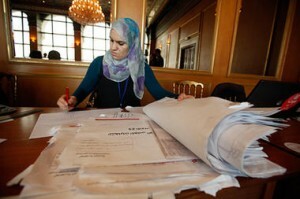 With two more rounds of voting remaining, it is small wonder that many Egyptians are afraid of what is to come. Early indications are that the Muslim Brotherhood will show well in free parliamentary elections, and the more doctrinaire Salafists will claim seats. Debates over the prospects for the Arab Awakening now rage as a result. After a spellbindingly rapid series of events in the Middle East in the early months of this year, progress seems to have slowed. The liberal spirit that characterized those nonviolent revolutions appears to be dissipating in favor of old rivalries—as well as the specter that new forms of repression will simply replace their predecessors. What’s happening now in Egypt and Tunisia—to say nothing of Bahrain and Syria—is also bringing back to the fore worn-out arguments claiming that nonviolent struggle works slowly, while violence is quick. Efficient, even.